Snowmobile or glacier walk optional extras! Driving south on Highway 1, we’ll introduce you to the geology, history and folklore of Iceland, while we stop at the magnificent waterfalls of Seljalandsfoss and Skógafoss. You will also see, depending on the conditions, Iceland’s newest star, the Eyjafjallajökull volcano, that erupted in 2010. 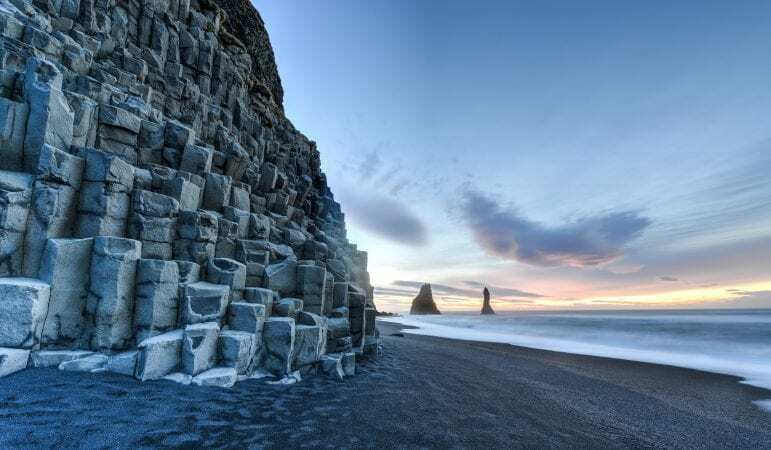 Following the coastline, we’ll take a detour to a beautiful black sand beach called Reynisfjara. There we can get close to basaltic rock pillars, enjoy the view of a group of sea stacks, and witness the power of the sea. Puffins also nest in this area during the summer. Another site of the South Coast is the small town of Vik, where we’ll take the lunch stop (now we also have another option for lunch at Reynisfjara, so depending on weather, timing, and amount of people, we might have lunch by the black sand beack at Reynisfjara). The gastronomic selection once outside Reykjavik is the one of a sparsely populated country like Iceland, where the fuel stations are the blood line. Don’t expect fancy restaurants. After the breath-taking beauty of Reynisfjara’s coastal scenery, we’ll head out towards the glacier Sólheimajökull, one of the outlet tongues of the ice cap Myrdalsjökull. We’ll walk right up to the glacier’s edge, and get to touch it. If in luck, we might even find an ice-cave. Please make on-line booking at least 24 hours prior to the departure. Lunch stop on the way (lunch not included). Operated by minibus. Small groups. Personal service. Sustainable. If you choose to book the Glacier Walk or the Snowmobiling optional extras, then you will not be visiting Vik, Reynisfjara beach or Dyrholaey. This also means that you won’t be at the lunch stop, so you should have some picnic for lunch (in the morning we stop at a fuel station where you can also buy some food). There is also a couple of places where you can buy some food, but the offer is limited, and not cheap. Includes Seljalandsfoss and Skogafoss waterfalls, and a Glacier Walk with crampons on the Solheimajökull glacier. About 1h on the ice, and 3 to 4 hours total hike. Includes English speaking glacier-guide, helmet, crampons, ice axe, and other safety equipment needed for the ice. Please bring warm and waterproof clothing. Walking-hiking shoes. Includes Seljalandsfoss and Skogafoss waterfalls, and about one hour snowmobiling ride on Myrdalsjökull with all safety equipment needed included. The tour starts from our base, after a short briefing and dressing up in a snow suit we step into a real glacier truck and drive up the mountain to the glacier where we pick up the snowmobiles and ride to the glacier Mýrdalsjökull. Our guides will take you through safety procedures and equip you in special clothing and helmets. We provide you with everything you need for a safe and comfortable ride. The snowmobiles will not be a problem – it is just a matter of squeezing the accelerator or the brake. A valid driver’s license is required for the snowmobile tour.